Kruger Wilderness Trails is a walking safari in the Greater Kruger Park Area. It showcases the best of South Africa’s wildlife and offering world class nature experiences. The proximity to nature and the unrivalled feeling of “being in the bush” is the consistent theme of the Kruger Widerness Trails. The discerning features of the authentic safari experience are exclusivity of game viewing and access to a knowledgeable guide and trackers. Kruger Wilderness Trails is a unique 4 day walking safari for adventurers and nature lovers. Each day is spent walking through the 8000 hectare Greater Kruger Park reserve and 3 nights camping in a scenic location in the wilderness. 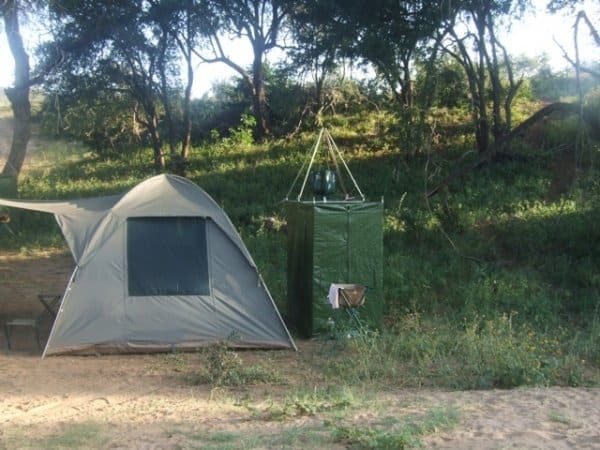 A maximum of 8 guests per day (sleeping in 4 tents) ensures a private Kruger walking adventure of a lifetime. A professional trained guide and tracker team will lead an informative, thrilling, and unforgettable walk in the wild. While guests are out exploring the reserve on foot, a support team will be moving the camp to a new location. 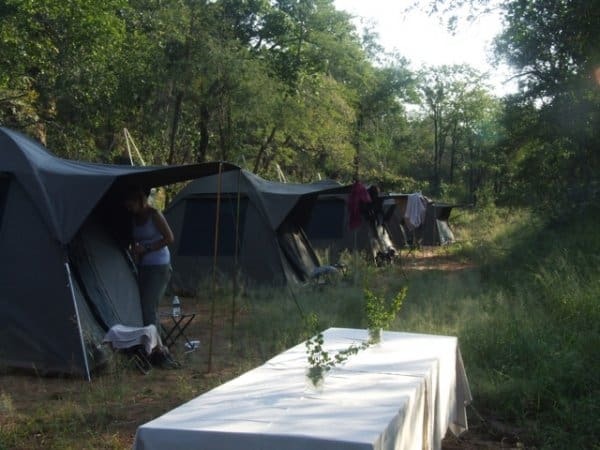 A packed brunch can be enjoyed in the bush, while snacks and refreshments will be on offer upon arrival at the camp. Spend the evening on a game drive, a mouthwatering campfire dinner and overnight in a canvas dome tent. 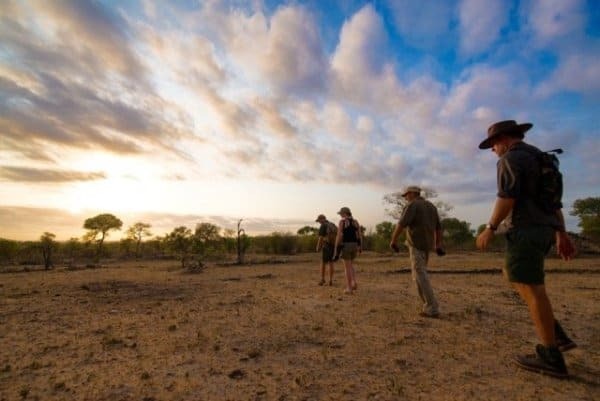 The emphasis of the trail is to spend time on foot in the Greater Kruger National Park, not only looking for the large mammals but also the smaller creatures. Your experienced trails guide will introduce you to aspects of the bush that are normally overlooked when driving around the Kruger Park. In keeping with the wilderness atmosphere, sites for the safari trail camps are carefully selected for their scenic beauty. The Kruger Lowveld area Kruger Lowveld is a region of superlatives. From the Great Escarpment’s scented forests and tumbling waterfalls, to the majestic Blyde River Canyon with its endless vistas over the Lowveld; from the southern reaches of the Kruger National Park, where it abuts the rolling cane fields of the Onderberg, to Barberton, in the lea of some of the world’s oldest mountains and the memories of the thrilling Gold Rush that once took place here. Game Animals exposed, fabulous photos, wild walks and bright-plumed birds. South Africa is globally renowned for its phenomenal game viewing and sound conservation ethics. Nowhere is this more apparent than in the iconic Kruger National Park, where 147 species of mammals – more than any other African wildlife area – exist alongside 517 bird species, 114 different types of reptile (there are 3 000 Nile crocodiles), 33 species of amphibian and 50 kinds of fish. Bordering the Kruger National Park are a number of private reserves- hundreds of thousands of hectares of conservation land adjacent to the Kruger National Park, with no fences in between and unlimited movement of game. The reserves showcase the best of South Africa’s wildlife and the Big 5. They offer the very best, authentic, close-up wildlife viewing and photography to be found anywhere on the African continent. Birds The Greater Kruger Park region has some of the most diverse habitats in South Africa and boasts an impressive bird list of close to 600 species. Birdwatchers can expect to see Kori Bustard, African Fish Eagle, etc. Safari vehicle for game viewing and transfers in and out of the reserve. Rates are quoted per person sharing and are subject to change without prior notice. Rates include government taxes, where applicable. If taxes increase, we reserve the right to increase the rate accordingly. Children 12 years and older are welcome to join at the standard rate. Accommodation, all meals and snacks (private chef), tea and coffee, professional trails guide and tracker, full day walking safari and evening game drive, transfers between Lamai gate and the camp. Overall rating: “Moderate”. You do not need to be ultra-fit but if you should be able to walk between 13 and 20 km per day. The route takes you along paths, tracks and through the veld. See Walking grades for more details about “Moderate” rating. 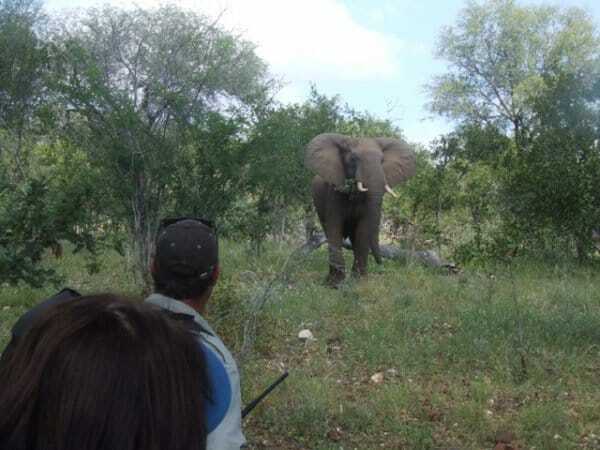 The walking safari is in the Greater Kruger Park, situated between Hoedspruit and Phalaborwa in Limpopo Province. It is an 8000 hectare private game reserve, which shares open borders with the Kruger National Park. The Olifants River courses through the reserve, while prominent mountainous ridges and boulder koppies characterise the terrain, making it an incredibly diverse and interesting region to explore on foot. Some of the world’s largest mammals find their home in South Africa, where elephant, giraffe, hippo, buffalo, and rhino reside in the wild Kruger Park and surrounding private game reserves. Game drives lead to unforgettable sightings of these large species, in addition to general game, such as zebra, impala, kudu, gnu, waterbuck, bushbuck, duiker, and wilderness trails steenbok, while nyala are frequent visitors to the camp itself. All walking trails are conducted by an experienced and knowledgeable guide who will point out the wildlife, birds and ecology of the area. You will be allowed to walk at your own pace amid splendid scenery and stop and enjoy what is of interest to your group. Although you may see amazing things, our wilderness walk is not intended to bring you close to dangerous game. Alternatively you can add attractions in the vicinity to your program-before or after the safari. We can recommend a number of interesting options and can assist with bookings to compliment your Kruger Wilderness Trails. The costs of these options are available on request. Bookings can be made throughout the year, starting on a Monday or a Thursday. Mild winters, with chilly evenings Summer months (September to April) are hot with occasional rains. The average mean rainfall for the year is 350mm, with most rainfall occurring during mid-summer (November – February). The rainfall generally occurs in the form of thunderstorms where a downpour is experienced, very seldom lasting longer than a few hours. The average maximum temperatures range from 24°C in July to 31°C in January with the average minimum occurring in July at a temperature of 8.5°C. OR Tambo International Airport: Pick up is at 06h45 from the airport with the Ashtons Shuttle. Guests will return to OR Tambo between 17h00 and 18h00. Hoedspruit/Eastgate Airport: Pick up and drop off is scheduled to tie in with flights into and out of Hoedspruit from Cape Town and Johannesburg. Lamai gate: Guests who arrange their own transport, or are self-driving. Guests should aim to arrive at 12h30. Guests will be dropped off at 11h30 on day of departure. Comfortable, well ventilated clothes. Wear neutral coloured, lightweight clothing with short and long sleeves. Good walking boots (already worn-in) and long trousers for walking safaris. Bring a thick windbreaker/jacket and gloves for evening game drives. For your daily needs, you are advised to have a day-bag, a plastic bag to waterproof your day-pack, sun-hat, sunglasses, sun block, a water bottle, personal first-aid kit, camera, binoculars. A torch and headlamp are important. Basic solar heating is provided. Cell phone charging facilities not available. Bring a solar charger. Kruger Wilderness Trails is a unique wildlife experience.